Welcome to the wonderful new Robin’s Rest Bed and Breakfast in the sought after suburb of Kwaaiwater in Hermanus. Situated on the main road near the golf course and the famous cliff path, this newly renovated house offers charming contemporary accommodation. There are five double bedrooms with double beds of which one has two three quarter beds. They are all en-suite with decorated private patios. 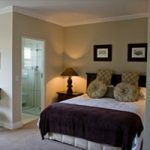 The rooms are all individually appointed in contemporary elegance and have DSTV facilities. 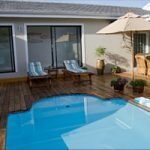 The bedrooms are all on ground level with a lovely flow to the pool where you can lounge on a beautiful sunny wooden deck. The easy going breakfast area flows onto the pool patio and large glass sliding doors take you out onto the restful patio with large cane chairs to relax in. Experience peace and tranquility here! You will be thrilled and inspired by the interesting art that adorn the walls of the open areas. Pleasing to the eye and thought provoking, the artworks blend in beautifully with the interiors. Robin’s Rest is a short stroll from the beautiful cliff path that leads to the pristine Grotto and Voelklip beaches. Or for the hiking and Fynbos enthusiast, the Fernkloof Nature Reserve is just around the corner. A five minute drive takes you shopping in the Hermanus village with a selection of boutiques, art galleries and restaurants. 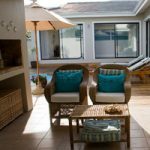 Come and enjoy the pristine beauty of Hermanus and be assured your stay at Robin’s Rest will be peaceful, tranquil and restful.